IMPORTANT! Due to the high demand for accommodation on the assembly dates, we can only guarantee bookings made before 1st April 2018. Remarks: Booking code: Jesuitas Booking deadline: 1/4/2018. The rate will be applied for booking the four nights from 8 to 11 July. The night of 12 July may be added to the booking but will be charged separately. Booking code: Jesuitas Booking deadline: 1/4/2018. The rate will be applied per night for booking from 8 to 11 July. The night of 12 July may be added to the booking but will be charged separately. ● Hotel rooms are subject to availability at the time of making a firm booking. ● Prices are shown in rates per night, with breakfast (VAT included). 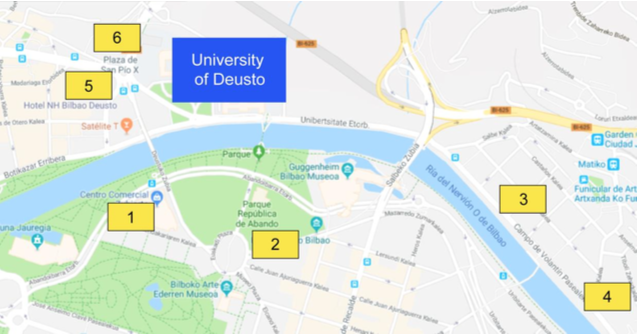 ● For bookings on days other than the Congress dates (8th to 12th July), please contact the agency directly at deustobio [at] carlsonwagonlit.es. Said bookings will not be eligible at the prices arranged by the Organising Committee.